Successfully Added LED Umbrella Light - Outdoor Patio LED Night Light to your Shopping Cart. 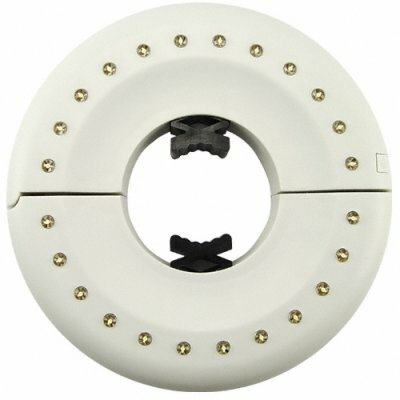 Great LED umbrella light with friendly white color for providing lighting to patios. Simple portable light fixture using standard AA batteries, you can now have a portable high power light source for your patio. How does it work? This model outdoor umbrella light fixture has a collar to fit both standard and extra wide patio umbrella poles. You simply open the fixtures "mouth" and snap the unit onto the umbrella pole. The integral center ring of the fixture is ribbed rubber and allows a firm but scratch-free mating to the pole. This is a truly portable light fixture that requires no external electrical power cords. Simply insert four AA alkaline or rechargeable batteries and turn it ON. The 24-count white LED's are evenly spaced within the fixture to provide smooth, glare-free light in a direct down position as well as a comfortable diffused light when mounted in an indirect up position. This model fits umbrella poles with diameters from 1 3/8" to 2" (approx 35mm to 52mm). As always, this wonderful product is offered to you at a low factory-dircect wholesale cost. From the leader in unique direct from China electronic products, Chinavasion.